In a few short weeks, our beautiful late summer produce will have vanished for yet another long year. The geniuses at The Acorn Restaurant on Main Street are seizing the day by highlighting these warm weather ingredients in a brand new, beautiful vegetarian menu. The newly invented dishes gracing Chef Brian Skinner’s fresh sheet include a chanterelle pappardelle with garlic, corn and basil, a carrot gnocchi with a goat cheese mousse, and a vegan Thai basil panna cotta with plums. Cocktails, being equally important, have not been left to the wayside. Try the “Stoned & Bitter” with rhubarb-infused rum, amaro nonino, apricot and bitter almond jam with crushed ice. If you’ve never been to the Acorn, now is a good time. 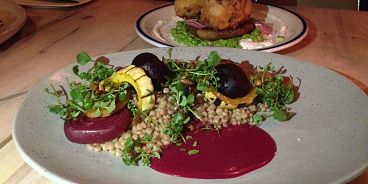 This funky vegetarian restaurant (with vegan options, too) is easily one of my favourites in the city, and many reputable sources agree it’s noteworthy. Last year, The Acorn was named one of Canada’s best new restaurants by enRoute Magazine and they’ve seen plenty of praise from international outlets like The New York times and CNN.